The Tongariro National Park encircles the volcanoes of Tongariro, Ngauruhoe and Ruapehu and features some of New Zealand’s most contrasting landscapes. 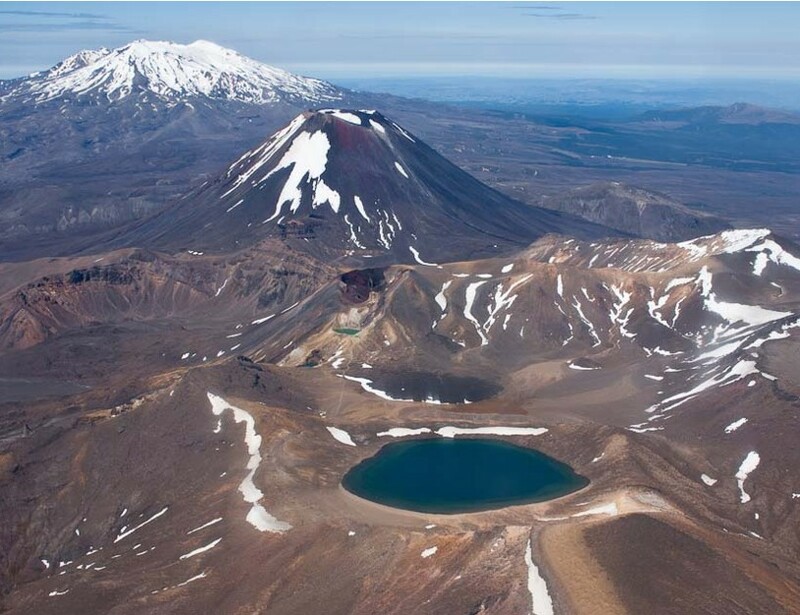 Tongariro National Park – covering almost 80,000 hectares – was gifted to the nation by Maori chief Te Heuheu Tukino IV in 1887. Just over a hundred years later, the park was awarded dual World Heritage Site status. Emerald lakes, alpine meadows and hot springs surround the largest volcanoes in the North Island, offering an environment of stunning diversity. All three volcanoes are very much alive, with Mount Tongariro erupting as recently as August 2012. But this doesn’t deter people from skiing down the slopes and hiking to the craters – a monitoring system provides early warning of eruptions. The park's most celebrated activity is the 'Tongariro Alpine Crossing', a one-day trek that traverses the otherworldly terrain along the slopes of all three mountains. Steaming craters, old lava flows and thermal lakes make the walk an unforgettable experience.